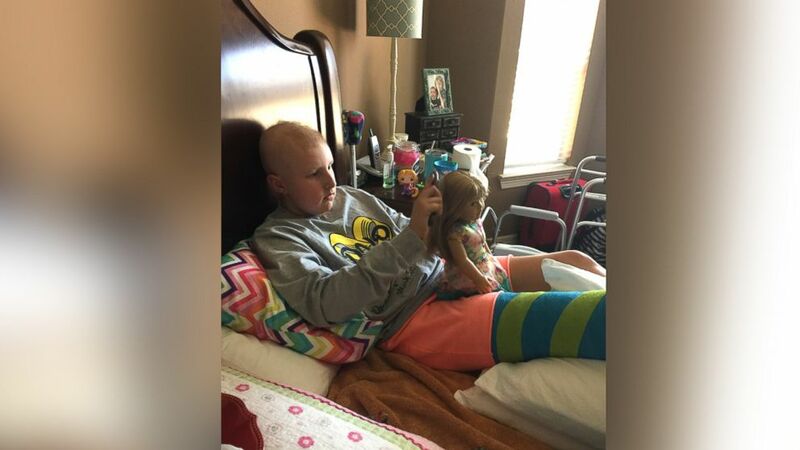 Dylan Probe, 10, had her right leg amputated after being diagnosed with cancer. Dylan Probe, 10, received a memorable surprise after having her lower right leg amputated because of cancer. The fourth-grader from Houston, Texas, was given an American Girl doll who has a prosthetic lower right leg. Dylan promptly named her new doll "Hope." "Hope" joins another doll, named "Faith," who Dylan received earlier in her cancer treatment. Faith, another American Girl doll, has no hair, which Dylan related to after losing her own hair to chemotherapy. Last November, Dylan was diagnosed with Ewing sarcoma, a type of bone cancer that is rare in children. As an active swimmer and soccer player who competed in triathlons prior to her cancer diagnosis, Dylan and her family chose an amputation to allow Dylan to continue her active life. She will be fitted with a prosthetic leg after she recovers from the March 17 operation. Dylan also has to complete eight more rounds of chemotherapy, her mother, Megan Probe, told ABC News. (Megan Probe) Dylan Probe, 10, received an American Girl doll with a prosthetic leg after having her own leg amputated due to cancer. By Dylan’s side during her next rounds of chemotherapy will be Sherina Welch, a Houston-based professional photographer. It was Welch who gave Dylan the doll through donations made by family and friends. Welch is photographing Dylan and five other pediatric cancer patients for a photo series called “More Than Four.” The name symbolizes an estimate from the Coalition Against Childhood Cancer that 4 percent of the National Cancer Institute’s budget goes toward childhood cancer. Once Dylan told Welch she loves American Girl dolls, Welch worked with a New York-based prosthetic company to custom design Dylan’s doll. Dylan described herself as being “in shock” when she received the doll. A friend even gave Dylan the crutches from one of her dolls so “Hope” can be more like her.